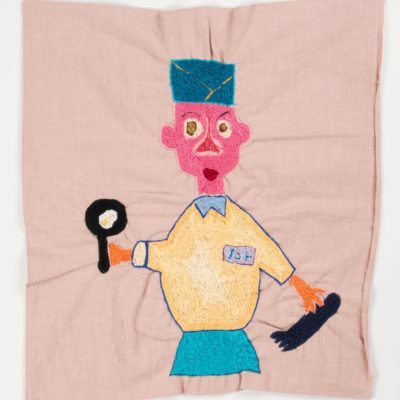 Chiaki Simizu embroiders various kinds of motifs. 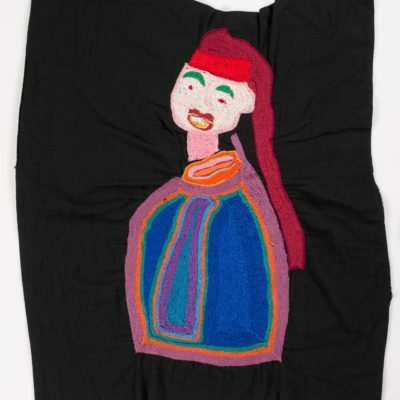 She sometimes combines a TV star and some famous picture in her embroidery. The contrast between the peculiar title she gives to her work and their thoroughness and the quality of it is one of her art’s charms. When she finds a motif she likes, she designs the pattern she will embroider. She then sews chain stitches orderly along the design, and embroiders in colorful threads. She likes to use bright colored threads of many shades, so it creates a fascinating effect.